The What: ATEN Technology has introduced the UH7230 - Thunderbolt 3 Multiport Dock solution. Designed to create a simplified, yet productive 4K workspace, the UH7230 offers more multiport connectivity and charging capabilities to MacBook or Windows laptops via a single Thunderbolt cable. The What Else: The UH7230 Thunderbolt 3 Multiport Dock quickly connects peripherals and displays video content from a laptop. Thunderbolt 3 provides high-speed data transfers, powerful performance, and light weight in a single form factor. The UH7230 supports dual 4K or 5K resolution for graphics-intensive multitasking, and allows users to connect one 5K display or two 4K displays (one DisplayPort and one Thunderbolt 3 USB-C port). With up to 40Gbps bandwidth, users can transfer files faster, and it supports up to 85W of power delivery for charging a laptop and USB accessories. The UH7230 can provide power to matched USB-C Windows or Mac laptops with PD Profile specifications of 20V/4.25A, 15V/3A, 9V/3A, and 5V/3A. 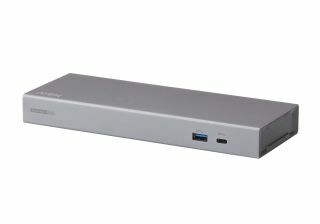 The Bottom Line: The UH7230 Thunderbolt 3 Multiport Dock is well suited for creative professionals and those who work with high-resolution, graphic-intensive images, video, and CAD drawings, such as video producers, graphic and web designers, architects, or any field requiring optimal quality displays and USB devices. It is now available for $220 USD via ATEN’s channel of distribution and reseller partners.